We see that Ellen Gray Massey has a new book out. It’s kind of an autobiography titled “Footprints in the Ozarks, a Memoir.” We’ll be watching for it on the shelf of our favorite bookstore. Ellen Gray Massey is a Missouri treasure. She has spent a large part of her life writing about life, teaching about life, speaking about life. Life in the Ozarks. Real people life. History is too often written about people who achieve high office or high rank. It’s written about explorers and outlaws. It’s written about broad topics such as wars and depressions, and political movements. Ellen Gray Massey’s books have been about people who are historical figures living next door, or who have lived next door or down the road from our parents and grandparents and great-grandparents. They’re not stories about people who use their hands to sign bills into law or use them to draw lines of strategy on map or use them to calculate economic trends and forecasts. She’s written about people with callouses who live and have lived their lives down home. 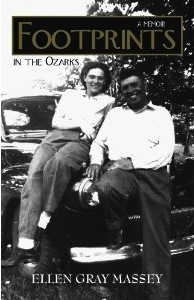 Back in the 60s and 70s, when Eliot Wigginton’s first Foxfire books came out that preserved the life and culture of southern Appalachian people, Ellen Gray Massey understood the value of having her students at Lebanon High School learn to write by writing about people and their culture in the Ozarks. The stories went into a quarterly magazine called “Bittersweet.” Before long there were enough articles to put into a book–“Bittersweet Country.” Another compilation of those articles followed later. She retired as a teacher more than 25 years ago but she has kept writing and has kept telling stories about the Ozarks and its people. So now she has another book out. We have been enriched by each of her previous books and now we are richer still. This entry was posted in Books by Bob Priddy. Bookmark the permalink.